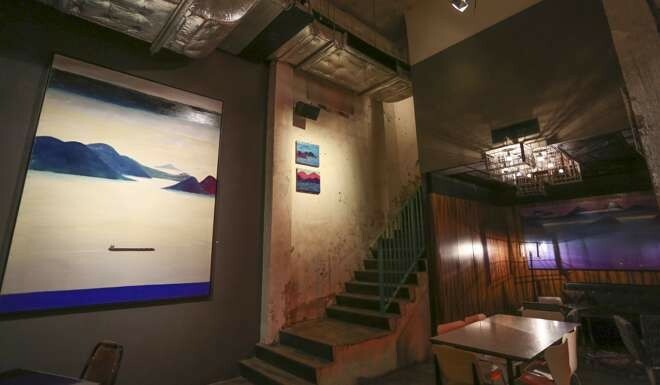 Long ago, Hong Kong’s harbour and islands became popular settings for painters and photographers, the ships, sea, godowns, mercantile establish­ments and people being of special interest. Hong Kong’s best post-war modern artist, Luis Chan, was himself inspired by the port city’s seascapes and made a series of ink paintings that included a changing array of fantastical local characters merged into a phantasmagorical landscape of seashores, islands, fish, rocks and distant, ever-present hills. Briton Richard Winkworth has joined this artistic continuum. In 2007, the artist moved into a high-rise industrial studio in Ap Lei Chau with a stunning view of the East Lamma Channel, Lamma Island and beyond. A constantly changing vista of light, shadows and weather acts as backdrop to the activity on the water: huge container ships, smaller kai-to and fishing boats make their way through this narrow sea channel. From his eyrie, Winkworth has beauti­fully captured the changing moods and scenery of the sea below. The painter’s own connection to Asia’s seas dates from his birth, in Mumbai, then Bombay. The son of an officer of the British-India Steam Navigation Company, as a young boy in the 1960s, Winkworth often criss­crossed Southeast Asia by boat, until his relocation to Britain for schooling. He went on to study fine arts at the University of Brighton and the Chelsea School of Art, in London. In the 90s, he often visited Hong Kong to exhibit and eventually settled here. In his latest solo exhibition, “The Sea”, Winkworth focuses on his impressions of activities of the surrounding landscape and sea, but he has a wide-ranging eye that ventures beyond the view from his windows. Distant Lantau Island is a constant attraction and his Boats at Anchor off Lantau (2016) sees the hills catching the last of the sunset while moored boats are bright in readiness for the night. Under Winkworth’s hand the night becomes alive; in Full Moon Over East Lamma Straits (2016), the lapping sea and distant bobbing boats are lit up in an inky moonlit landscape. While charting the changing colours of Lamma’s hills, rocks and islands, his paintings also always carry the mark of human activity: distant radio transmitter antennae, the wake of a boat passing in the water, smudges of apartment lights in Ap Lei Chau. In Pollution White-Out (2016), even haze has a transparent beauty, inter­rupted only by a red-funnelled tanker. Winkworth’s largest paintings are oils on canvas but the majority of the exhibition comprises the seldom-seen encaustic on wood technique. Winkworth explains that “encaustic” is derived from the Greek word enkaustikos, meaning to “burn in”. The process uses a mixture of beeswax, dammar resin and colour pigments painted on a wooden surface; these are all heated and, as the wax melts, become embedded in the wood. Repeated many times, the process builds a “complex fusion of embedded colour”. The finished paintings are highly stable and durable – and wonderfully colourful.